Green (undisclosed) agreed to an injury settlement and was waived from the Bills' injured reserve list, according to the league's official transaction log. Analysis: It still isn't clear what sort of injury Green is dealing with. In any case, he now becomes an unrestricted free agent should he pass through waivers unclaimed. Green (undisclosed) cleared waivers and was placed on injured reserve Tuesday, per the league's official transaction log. 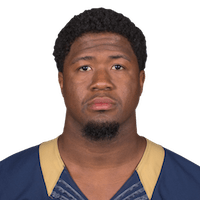 Analysis: Green hasn't suited up for a game since making two appearances for the Rams in 2016, where he only played on special teams. The 25-year-old running back no longer takes up a spot on the 90-man roster. Green was waived by the Bills on Monday with an injury designation, Mike Rodak of ESPN.com reports. Analysis: Green's injury is undisclosed for the time being and it's unclear if it is serious or not. If he goes unclaimed in the waiver process he'll revert to the Bills' injured reserve list. There are no videos available for Aaron Green. Click here to view all videos.